Located on 76 pristine acres in the heart of Niagara-on-the-Lake, Two Sisters Vineyards offers visitors a love affair with great wine and great food, inspired by a simpler time. At Niagara's newest premium winery, both our culinary and winemaking processes are rooted in a 'less is more' philosophy. Situated on the northern tip of the Niagara River Appellation between Lake Ontario and the Niagara River, you'll find a terroir unique in the peninsula. The prevailing air currents at our site serve to protect our vineyards from extreme cold by preventing cooler air from settling on our vines. Instead this cold air is swept away and pulled into the Niagara Gorge. The growing season is longer here; prolonging our harvest and concentrating the ripe flavours in the grapes allowing us to craft wines that are rich, robust and true to varietal character. Our commitment to quality winemaking begins in our 60 acres under vine where premium farm practice is our focus. Our goal is to allow our unique terroir to shine through our wines. We want to share wines that are expressive and true varietal representations. The inspiration for our winery building comes from the architecture of the Renaissance. To classic themes we have added modern touches to create a place both beautiful and timeless giving our winery a uniqueness which, set against the backdrop of our stunning vineyard makes our visitors feel as though they have been transported to a very special place. 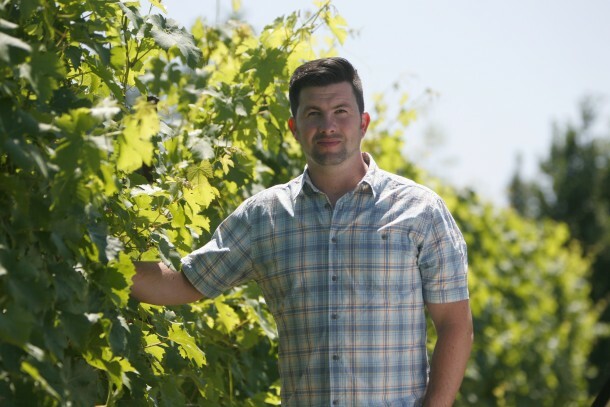 Since graduating from the Winery and Viticulture program at Niagara College, our Winemaker Adam Pearce has been making award-winning wines in Ontario's Niagara Peninsula and British Columbia's Okanagan Valley. Adam has also gained international winemaking perspective while working and travelling in Australia. Adam's talents have been recognized both domestically and internationally with some of the proudest accolades coming in the form of the British Columbia Lieutenant Governor's Award for Winemaking Excellence, as well as a Favourite Canadian Wine selection by world-renowned wine critic Jancis Robinson. Adam takes a non-interventionist approach to crafting wines, believing that some of the best are the truest representations of varietal character. Quite simply, he chooses not to 'over-make' wines allowing the grapes to speak for themselves. Adam's 'less is more' winemaking philosophy is perfectly aligned with our desire to create a place in Niagara where wine lovers can sit back, relax and reminisce about a simpler time.